Delicious soft chocolate you can model like clay! 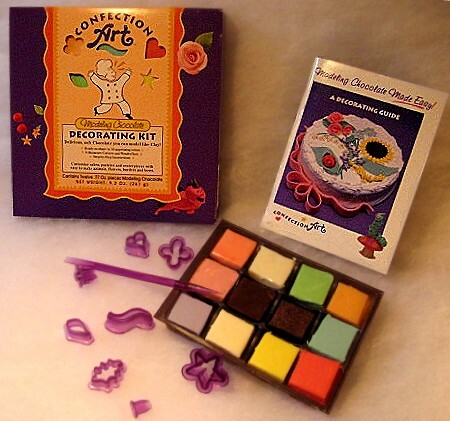 Modeling chocolate is used by famous cake artists to create flowers, figures, and designs. We created this very user-friendly kit because we believe everyone, not just professionals, should have the best materials to make decorating fun and easy. Edible chocolate dough comes with a set of nine tools and 12 squares of multi-colored ready to use (and eat!) modeling chocolate. 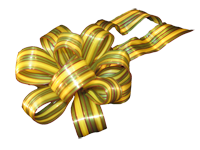 We include our 44-page booklet “Modeling Chocolate Made Easy” as our gift to you. This book has illustrated instructions for modeling figures and making decorations, themed cake ideas and complete instructions for an adorable and easy gingerbread cottage. A great family activity or gift for ages 5 and up. As sold in HearthSong catalog for more than a dozen years. Confection Art modeling chocolate is vacuum-sealed and will keep on the shelf for six months in temperatures under 85 degrees. $16.95 plus $6.95 shipping and handling. 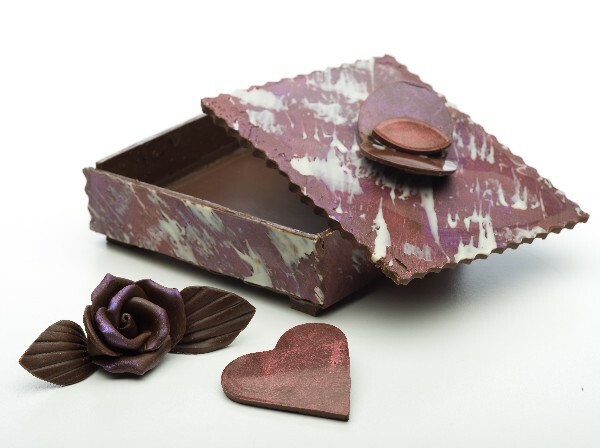 Make a chocolate box with our simple and delicious kit! From the Oregon hazelnut cookie wheels dipped in dark chocolate and filled with a pure chocolate swirl to the piped handlebars, this bike is unlike any other. Even the gears are made from the best quality pure chocolate. 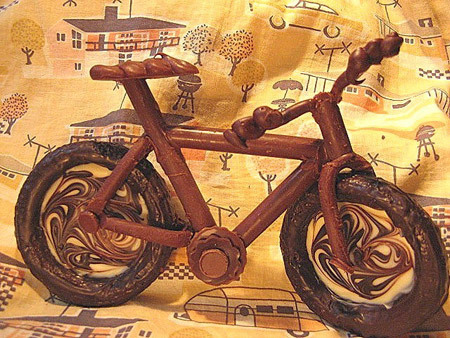 100% edible, 100% delicious, what could be a better gift for your favorite cyclist? Hand made in Bike Town (Portland), USA. Dimensions: approximately 7” long, 5” tall, 4 oz. Local orders only: $24.95 or as priced in your favorite local store (sorry, this product does not ship). Contains nuts, wheat-free. Ingredients: Pure milk, dark and white chocolates, hazelnuts, egg whites, sugar, natural flavor. Bike frame, handlebars and seat are pure chocolate, wheels are flourless chocolate hazelnut cookies covered and filled with pure chocolate.